Everyman Band was an experimental fusion group from New York that recorded two forward thinking albums for the electric European label ECM. Without Warning (ECM), the band's second album is the only one available on CD/download unfortunately, but it still gives you great insight into what good fusion sounded like outside of Return To Forever, Mahvishnu and Weather Report. Everyman Band seemed to combine free thinking jazz and blues with the prog aesthetics of Adrian Belew-era King Crimson to a much more comfortable degree. This was highlighted by the superb work from an up and coming guitarist named David Torn. While nowhere near the quality and distinction as the aforementioned bands, Everyman Band did produce something worthwhile and forward looking in the early 80s for what jazz could be 20 years later. Their youth and lack of creativity was at times their strength. It showed that they were willing to work and play with as many ideas as possible. Sometimes it doesn't always work but its good to hear someone trying. The band were never well received at the time and I believe not too many people would even remember them today. But if you have a chance take a good listen. 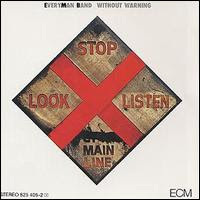 Everyman Band's Without Warning is available pretty cheap for download.